Sports and pastimes have been popular in Sussex for centuries. Cricket, stoolball and horse racing were commonplace. However, there have also been less talked about sporting events: there were many running races, a fair degree of sparrow shooting, and a host of entertaining local sports days, comprising of events such as the hundred yard balloon race, the pillow fight, and the menagerie race! Many members will remember Mathew’s excellent talk to us two years ago on the history of Pub Life in Lewes. Congratulations to the LGH Street Story teams from the area around St John-sub-Castro church for their fascinating September exhibition. This image from the church collection, thought to date from the 1870s shows the view to the church and features the Elephant & Castle and the future Paddock Road. This photograph, from an old scrapbook I was lent, was taken when demolition was imminent and archaeological work due to start. On Thursday 31 October 1963 the Lewes estate agent Clifford Dann offered a series of East Sussex properties for sale at an auction held in the Corn Exchange. 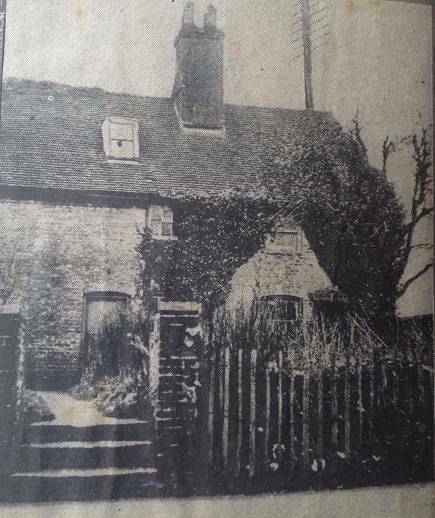 These included a large 7-bedroomed house called The Grey House, to the west of Malling Hill and the north of Spences Lane, owned by a Mrs Margaret Irene Gosling. The Grey House had extensive grounds, including a large artificial mound created in the 19th century as a burial for a favourite horse. The property offered for sale benefitted from two recent planning permissions granted by Lewes Borough Council. One, granted in September 1962, envisaged the conversion of The Grey House into three apartments and the creation of 42 new flats and 14 houses in its grounds. A second, granted earlier in the same month, revised the layout, to give 40 houses in the grounds. A condition of the sale was that Mrs Gosling and her servants were to be permitted to continue living in The Grey House, and to have exclusive use of its garaging and stabling, without payment of rent, until a set date in 1964. She was also to be allowed to remove the monument standing on the mound in her grounds, its railings and some young trees that she had recently planted. Offered for sale at the same time as a separate lot was a nearby plot of building land on the south side of Spences Lane owned by Mr John Curtis Gosling. 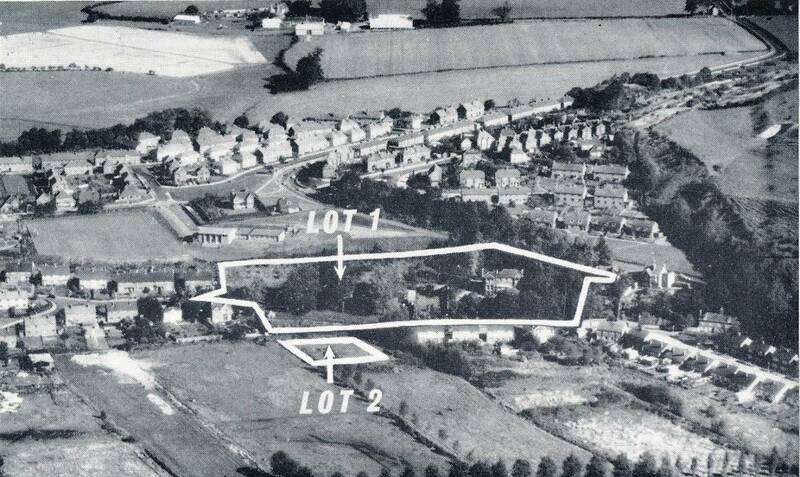 This plot also benefitted from outline planning permission for residential development granted in October 1963. This plot must surely have been under water in the 1960 floods, just three years earlier, but this was evidently not considered an obstacle. The houses built on this second plot, one of the lowest points in Malling Brooks, were to be flooded by several feet of water in 2000. 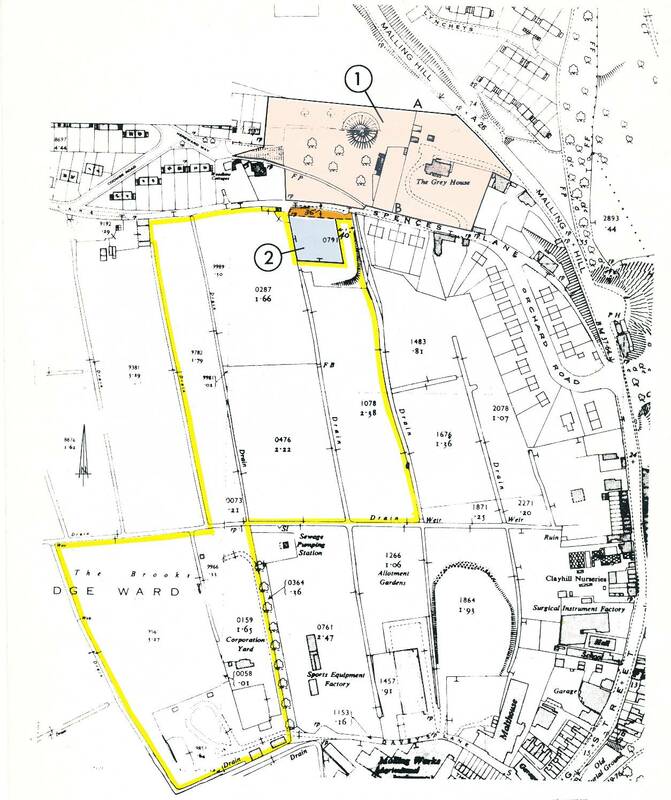 The two plots, and the state of development in the area at that time, are shown on a plan included in the auction particulars. In November 1875 the Lewes surveyor George Fuller was asked by solicitor Wynne E. Baxter to value the Wallands Park Estate. Wynne Baxter, who was moving to practise in London in this year, was the eldest son of the John Baxter who had established the Sussex Express. George Fuller noted that he was “perfectly cogniscant” with the Wallands Park Estate, the plan of which, for building purposes, he had prepared, and also with the value of property generally in the area. It has been noted previously, in Bulletin No.22, that work on Mr W.E. 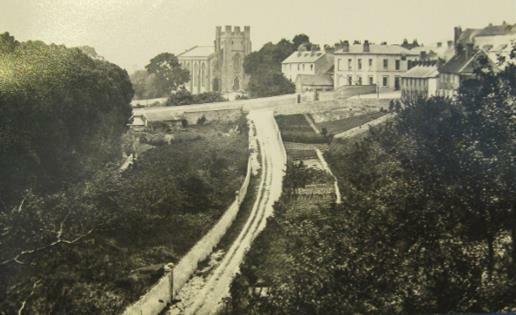 Baxter’s project for Wallands Park to become a new suburb of Lewes had started before 1870. The total annual rent charge payable each year was thus £136 10s 0d, but the purchasers were entitled to redeem the rent charge by transferring consols to Mr Baxter’s executrix that would produce an annual amount equivalent to the rent charge. On this basis George Fuller valued the rent charges at a capital sum of £4,151 13s 4d. The second part comprised land that had not yet been built on, of which there remained 46 acres. Fuller noted that while some roads had been laid out, and others partly made, this land was in the main let for garden purposes at rents that varied between £6 and £8 per acre per annum. The annual value of these garden rents was thus, at this date, more than twice the value of the rent charges on the houses so far built. However, Mr Fuller considered that the value of the current garden rents did not fully reflect the value of the land because of its potential as building land. He noted that a quarter acre of the land that was the furthest from the town, and the least eligible for building, had just been sold at a ground rent equivalent to £60 per acre per annum, equivalent to consols that could be sold for £1,880. He considered that if the whole property were to be sold by auction tomorrow it would fetch £750 per acre (£34,500 for 46 acres). 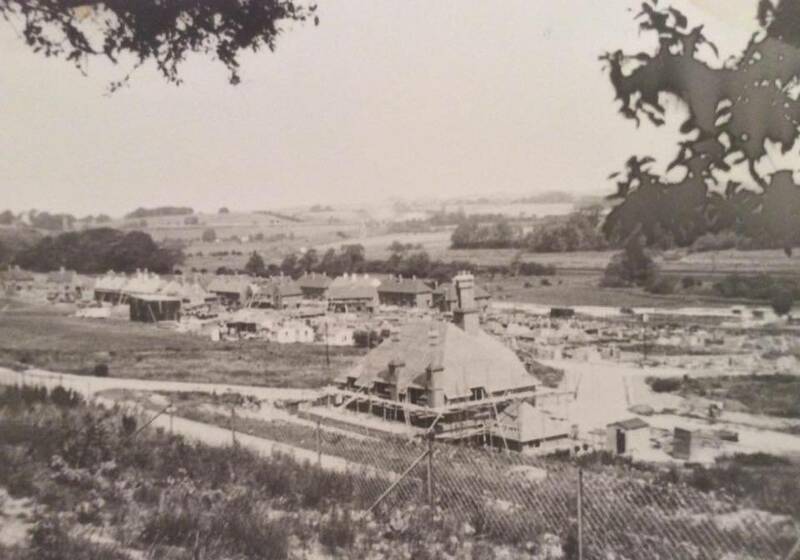 He noted that there was little other building land near Lewes, and that many of the sites available on the Wallands Park Estate were the best available locally. More conservatively he estimated that the 5 acres nearest the town were worth £1,000 per acre as building land, and that the next best-positioned 20 acres could safely be valued at £500 per acre. If the remaining 21 acres were valued as agricultural land at £250 per acre, this would give a total value for the second part of the Estate of £20,250. Adding in the capital value of the rent charges on the plots already sold, he estimated on this conservative basis that the total capital value of Mrs Baxter’s interest, as executrix to the estate, was just under £25,000. £25,000 was of course a very substantial sum in 1875, when a working man would be lucky to earn £50 p.a., and £100 p.a. was considered a good salary. Then, as now, building land was more valuable than agricultural land, but by a factor of less than 10. In the 21st century a local developer gaining planning permission for agricultural land would be looking for a mark-up of closer to 100-fold. No wonder 21st century houses are expensive. This photograph shows the Tally Ho public house, Landport, under construction in 1937. The first of the new council houses can also be seen rising in the background. This entry was posted in Ecclesiastical History, Economic History, Lewes, Local History, Urban Studies. Bookmark the permalink.